Her Royal Highness Princess Euphelma Choden Wangchuck inspired some secondary high school children from in and around Thimphu to learn about and understand climate change issues through interactive and fun-filled exercises using space technologies for practical day-to-day uses at a special youth event organised on 16 November 2011. Her Royal Highness has shown keen interest in this topic and was present throughout the morning’s session. The event was part of the SERVIR-Himalaya Youth Forum ‘Earth Observation: Empowering Youth for Climate Action in the Himalayas’ which is being held from 14 to 19 November. SERVIR Himalaya is a joint initiative of the United States National Aeronautics and Space Administration (NASA) and the International Centre for Integrated Mountain Development (ICIMOD) for regional monitoring and visualisation of key environmental and natural resources in the Hindu Kush-Himalayan region. The event also marked the celebration of geography awareness week and GIS Day, promoted by National Geographic. 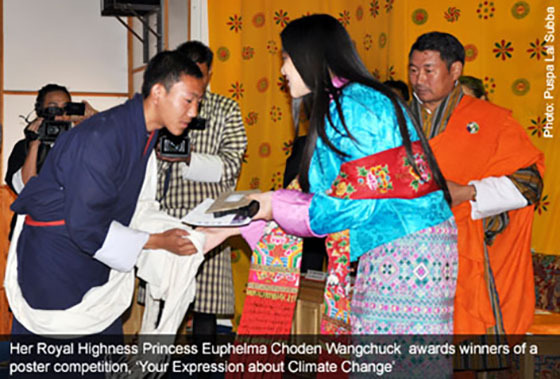 Her Royal Highness also presented awards and certificates to the winners of a poster competition, ‘Your Expression about Climate Change’, organised by ICIMOD and Lungtenzampa Middle Secondary School (LMSS), Thimphu on 2 September 2011. The competition focused on the four themes of the Bhutan Climate Summit being held this week – water, food security, biodiversity, and energy. The Honourable Lyonpo Dr Pema Gyamtsho, Minister of Agriculture and Forest, Royal Government of Bhutan, in his opening remarks said, “I hope that our youth, in whose hands lies the future of our planet, will get a clear appreciation of the technology and its applications. As the leaders, parents, and scientists of tomorrow, youth will have a leading role in determining the fate of future generations and in fact the future of our planet”. “In areas where the topography is extremely inaccessible, GIS and remote sensing technology are undoubtedly very useful for the study of climate change issues. Young people, as an important segment of our society, need to be empowered with right kind of information and tools to help them understand climate change and broader environmental issues in the Himalayas’, emphasised Dr Andreas Schild, Director General of ICIMOD. Other prominent speakers were Professor Emeritus Bruno Messerli; Dawa Steven Sherpa, World Wildlife Fund (WWF) Climate Ambassador; Dasho Karma Ura, President, Centre for Bhutan Studies; and Mr Jason Kessler, NASA, USA. During this occasion, a Memorandum of Understanding on ‘Promoting Herbal Gardens in Schools’ was signed between ICIMOD and the Council for Renewable Natural Resources Research of Bhutan, Ministry of Agriculture and Forests – thus launching in Bhutan an initiative that has already raised awareness of the conservation and uses of medicinal and aromatic plants among youth in 21 schools in Nepal. Coinciding with the Bhutan Summit ‘Climate Summit for a Living Himalayas 2011’, the SERVIR Youth Forum was organised by ICIMOD in close collaboration with Ministry of Agriculture and Forests, Bhutanese Youth for Climate Action (BYCA), under the framework of the SERVIR Himalaya Youth Initiative, and is supported by the United States Agency for International Development (USAID) and NASA.